I understand Pinterest and have a business account. My traffic is tanking, now what? How do I even know if what I’m doing is working? How do I turn views and saves into clicks? How do I get more conversions clicks? How can I maximize my efforts with limited time? How can I better understand analytics? Are Promoted Pins worth it? Where do I start? How do I automate pinning? 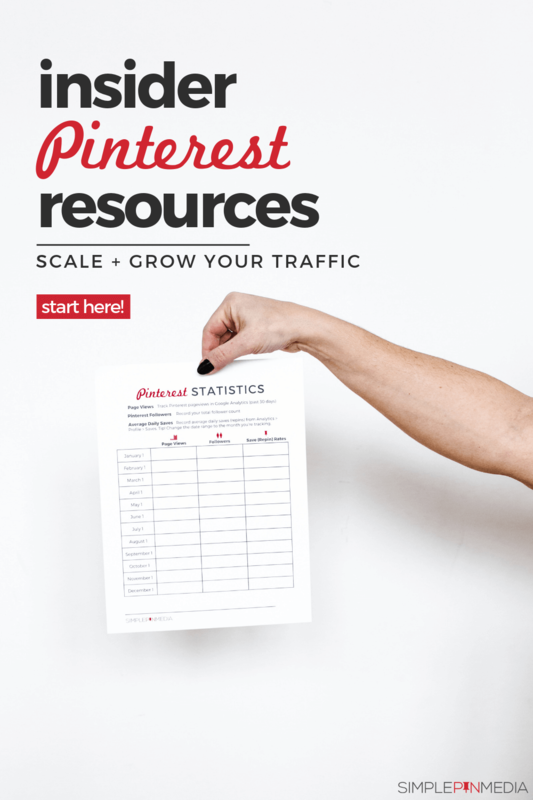 How do I grow my email list using Pinterest? How can I create pin designs that convert? Be honest, Pinterest marketing can be overwhelming at times, right? With over 130 clients (and counting!) we know a thing or two about Pinterest. Sign up to receive must-know insider tips, designed to help scale and strategize your Pinterest Marketing. I wanted to let you know I LOVE YOUR SERVICE. Oh my gosh, Jessica is amazing. She is attentive to all my questions and she knows her stuff. The only change I hope to be making in the near future, is to bump UP my plan 😉 I sure am grateful to be your client! The deep dive analytical report from Simple Pin Media was so helpful! It allowed us to see in a more comprehensive way just what is working and what is not working on Pinterest when it comes to our blog. We were able to refine our strategy to create more content that resonated with our readers on Pinterest and create better looking, more attention-grabbing images that would lead to more repins and more blog traffic. The deep dive provided us with amazing insight into just what our audience is looking for and allowed us to provide a better experience for our readers and their needs! The in-depth analytics report was incredibly helpful in guiding my content creation and site monetization moving forward. The report went beyond the basics of Google Analytics and took the data report one step further. With the analysis and suggestions in my report, I am able to focus my efforts on those topics and projects that I know will resonate most with my readers, saving me time and increasing my business’s potential earnings. I have been really pleased with the management of my account as well as my follower growth. Courtney is fantastic to work with, she is informative, responsive, and always finds the answers to my questions! I actually like using Pinterest now that Simple Pin takes care of so much for me. Ready to let us take Pinterest management off your plate so you can focus on growing your business? We're excited to get started! Click through to learn which Simple Pin services best fit your brand's needs.